Moscow, a world city with modern designer shops, famous department stores GUM and TZUM with a serious facelift since Soviet time, one of the highest concentrations of 4-wheel drives per square kilometre, snail paced traffic jams, city centre restaurants mainly catering foreigners, business is booming. 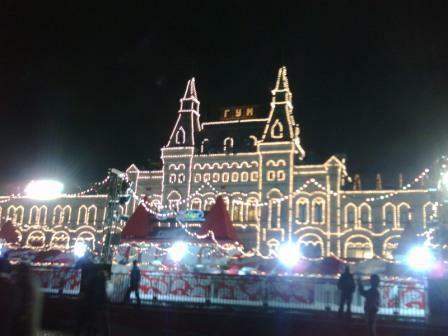 Flights to and from Moscow are fully booked. The rows of business class seats that shrank to 3-4 during the economic crisis have expanded back to 15, the economy class is packed. If you live in Moscow and wonder what to do on a winter Sunday afternoon you may think “Oh, let’s go skating at the Red Square and have a hot chocolate at the rink afterwards”. 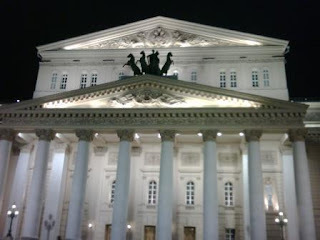 The famous Bolshoi Theatre re-opened recently the doors and the stage after a thorough renovation. We stepped in only to be faced with the airport type security gate and men in black with metal detectors. We saw the stairs inside and let it at that for now. The rich menu started with two pages of vegetarian dishes (how unusual! ), followed by Uzbek, Arab, Azerbaijan and Chinese starters, soups, main dishes. We started off with an appetizer selection of mutabal, tabbouleh, hummus and filled grape leaves. I would go back any time for the typical round Uzbek bread cooked in their special oven and decorated with black sesame seeds. I had a lamb shashlik that melted in my mouth, a colleague of mine took beef shashlik that was equally worth the some 1000 Roubles. What caught my attention was that there was mutabal, an eggplant dip, as well as baba ganoush, also an eggplant dip, on the menu. The difference of the two as I found out afterwards is that the mutabal is made with tahini and yoghurt and the baba ganoush or baba ganouj is made with pomegranate, walnuts, tomato. Or, who knows…the mutabal served in Uzbekistan was served with oil and walnuts. Grill the whole aubergines on the real flame or in the hot oven grill (250°C) for ca 30 minutes until the skin blackened and the inside is soft. Turn them around in between. You may put the aubergines into a bowl and cover it with a plastic bag for 15 minutes in the same way as you would remove the skin from the grilled peppers. Cut open and spoon out the soft eggplant. Mash into a paste with a fork. Add crushed garlic and a little lemon juice, mix. Let cool. Mix in the tahini paste, yoghurt and salt to taste. Place the mixture onto a serving dish and drizzle some olive oil on it and chopped parsley if at hand.